In the outskirts of the Atacama Desert, far from the light-polluted cities of northern Chile, the skies are pitch-black after sunset. 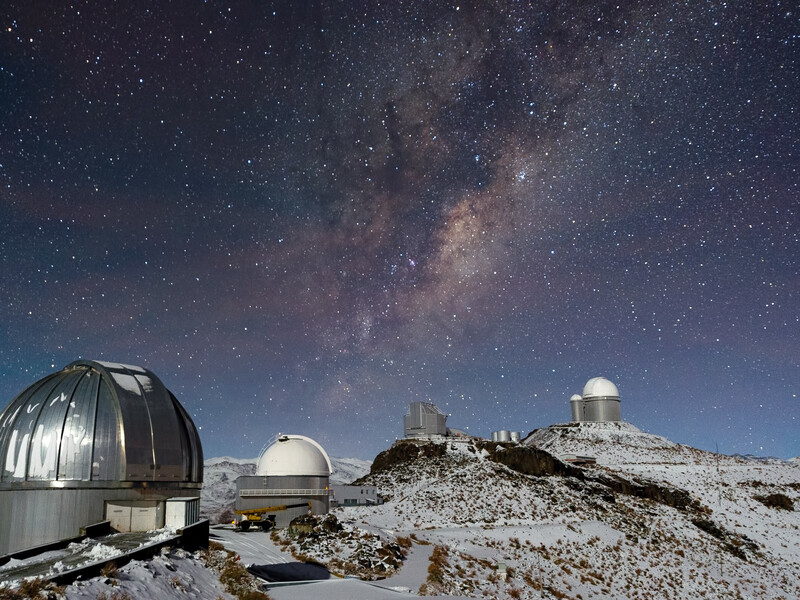 Such dark skies allow some of the best astronomical observing to take place — and at an altitude of 2400 metres, ESO’s La Silla Observatory has an incredibly clear view of the night sky. However, even such a remote, high, and dry location cannot always escape the weather that sometimes comes with the winter months, when blankets of snow can cover the mountain peak and its telescope domes. This image shows a wintry La Silla sitting beneath a spray of stars from our Milky Way, the plane of which slants across the frame. 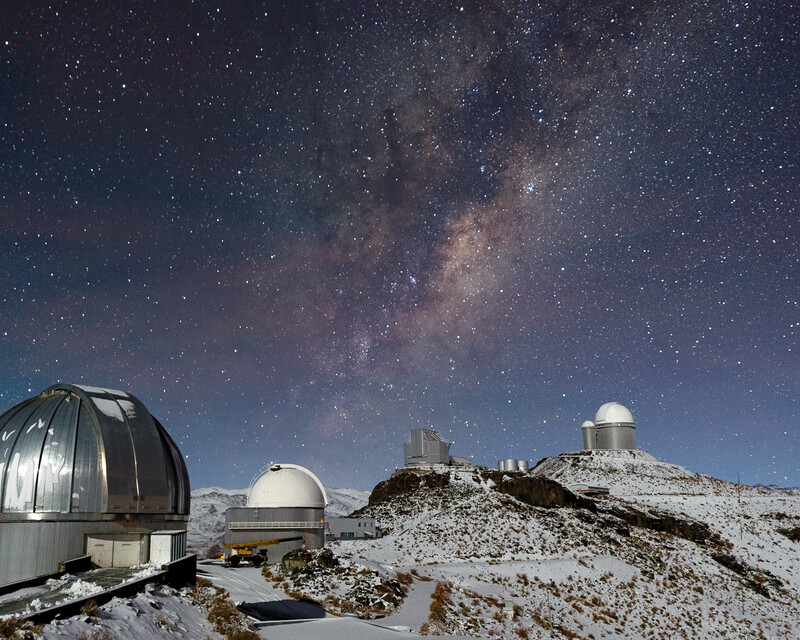 Visible (from right to left) are the ESO 3.6-metre telescope, the 3.58-metre New Technology Telescope (NTT), the ESO 1-metre Schmidt telescope, and the MPG/ESO 2.2-metre telescope, which has snow on its dome. The small dome of the decommissioned Coudé Auxiliary Telescope can be seen adjacent to that of the ESO 3.6-metre telescope, and between it and the NTT are the water tanks of the observatory. 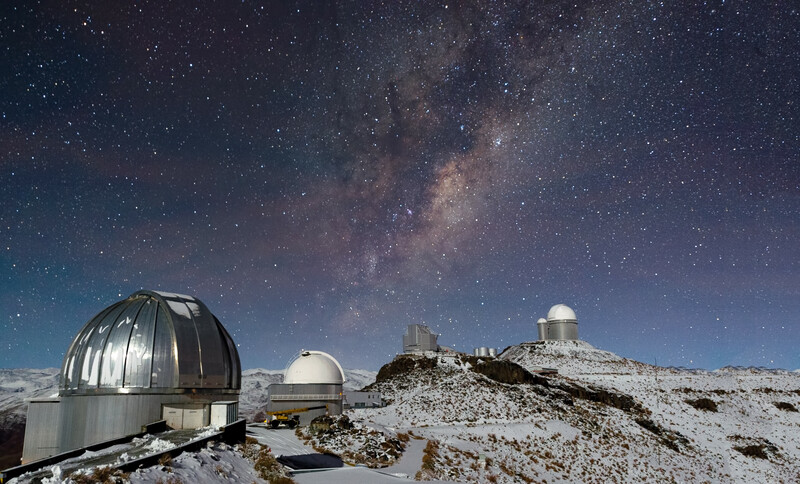 While the sight of snow at La Silla may initially be surprising, the high altitude ESO sites can experience both hot and cold temperatures through the year, and occasionally be subject to harsh conditions. This photograph was taken by José Francisco Salgado, an ESO Photo Ambassador.